Real estate pricing - we can always lower the price later. 🙅 Mrs Appraiser May Not Agree - Then What? Ask any appraiser and they will tell you that appraising a home is a blend of science and art. There is always room for interpretation. Of course, there are limits. Slapping a $600,000 price tag on a $425,000 house is futile. But what about nudging the price to $460K just to “test the market”? You can. Should you? Why not try, right? The cost of over-pricing is seldom in the seller’s favor. Frustrated homeowners lose time, see market enthusiasm plummet, and have to deal with appraisal issues with a property that is priced too high. On top of that there can be cancellations, and expired listings. As an agent, I hate to hear the words “can we just test the market?”. It almost never works out. Then the finger pointing starts. “Maybe the agent didn’t market the home right”. “Why isn’t my home being held open every day and twice on Sundays?”. I understand the mindset. Everyone wants to fetch as much as possible when selling a house. From one vantage-point it makes total sense to want to start high. But the question is “what does this do for you?”. It can impact your bottom line in the wrong way. Do I sound like a real estate agent with commission breath? At first glance, it might seem so. 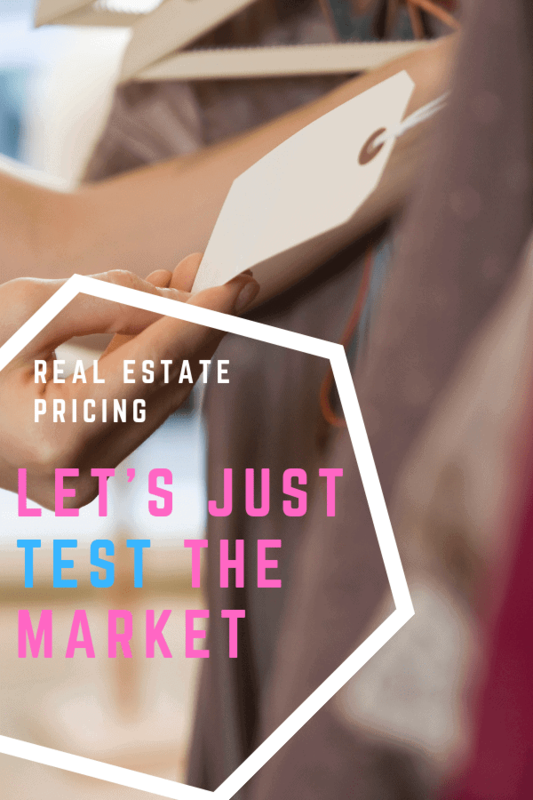 Let’s take a closer look at the reasons why having the right pricing strategy is so critical in today’s real estate world. We want maximum exposure when your home hits the market. So how to prices impact that? What do buyers think when they see a high price? For one thing, they probably have not seen your house? This is because people are searching in price ranges. If someone is looking for a two-story home under $400K in Tempe they set their parameters as such. Anything above or below that will not even appear on the radar. Those higher priced properties don’t even make it to their inbox. So those home buyers who are in the hood with their agents are out there looking at other homes, not yours. Ouch! Days on Market (aka: DOM) is an indicator that most agents pay attention to. We are human (in most cases, anyhow), just like you. If we see that a home is sitting on the market we immediately think something must be very wrong. And we agents are a tad jaded. We almost always think it’s the price. Are we right about that? In most cases we are. Disciplined agents study the market and know the trends. There are only a few variables when it comes to selling a house. Everything will sell at a certain price. If the home is not in good shape the offers will reflect that. The market is brutally honest about value. So if your house needs maintenance it will behoove you to get on that. Pronto. If the home is living under a rock because your agent doesn’t know how to get the word out then that will impact the price. And then there’s the price itself. 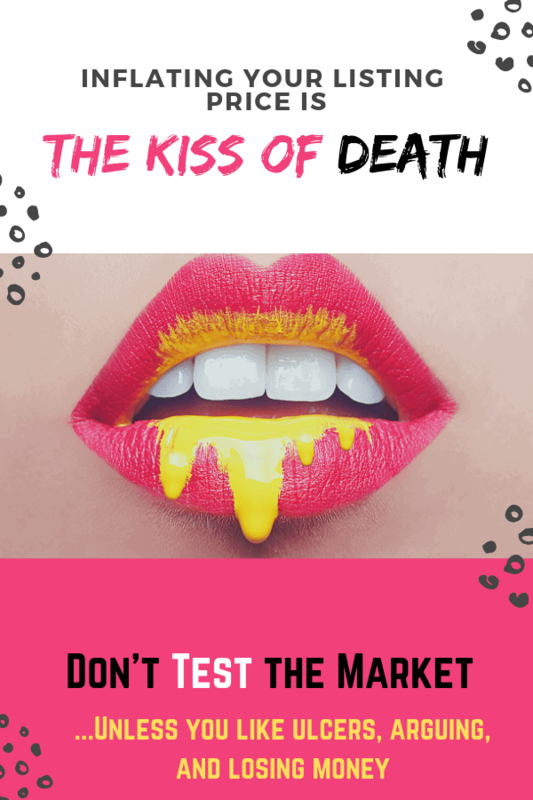 Too many days on the market is the kiss of death. It’s best not to let that happen. Now don’t get yourself all worked up over this cra-cra statement. It’s just the way people’s minds work. Let me paint you a little vignette. Barry and Judy are out there beating the bushes house hunting in your zip code. They’ve got this thing called the internet. They type in a city, a zip code, a neighborhood and BAM! Homes appear like magic just like your dream of. Furthermore, they can see what homes in those areas have recently sold for. So, it’s not hard to get down to brass tacks where price is concerned. The guy down the street hasn’t done a thing to his house in 30 years. Every neighborhood has that guy. …Your house might have new countertops and a new bathroom. The neighbor may have a newer roof. Another might have a pool and 3 car garage. Point being, that it is not all that hard to adjust for value and arrive at what most people are willing to pay for a house. This is how appraisals get started. Of course, there’s more to it than that, but it isn’t too tough to determine values. This is especially true where floorplans are built throughout a community and many people have the same plan. How would you like knowing that people are avoiding your house like the plague? Imagine, it’s your first week on the market and two houses on your street go up for sale. One is yours and the other is your long-time friend and neighbor Robin Edwards. Robin is being transferred by his company. Robin has to be in Portland in 3 months. Getting his home sold is a priority. Robin doesn’t want to live with the stress of two payments. You get your home listed and ask for more money than Robin does. You think he is underpricing his even though he paid for a neutral upfront appraisal. You think Robin’s approach to real estate pricing is leaving money on the table. That coming weekend Robin comes over and says he has 3 offers. You sulk inside even though you display that big smile of yours. Robin priced his home right at the top of the appraised value at $575K. You went for $605K; you had 1 potential buyer look at your home, and have no offers. Later you share this story with your agent. He says that it was an agent named Cheri who showed your home. Robin says his agent is helping him counter all three of the offers. One of those offers is from the same agent who showed your home. Why didn’t the other two people go to see your home? The next day Robin tells you that his house is under contract for slightly above the asking price. Deep down inside you realize that you’d be jumping with joy to get that kind of money for your house. Furthermore, you would be all the more eager to have that contract so quickly. What if you would have priced it to the market? 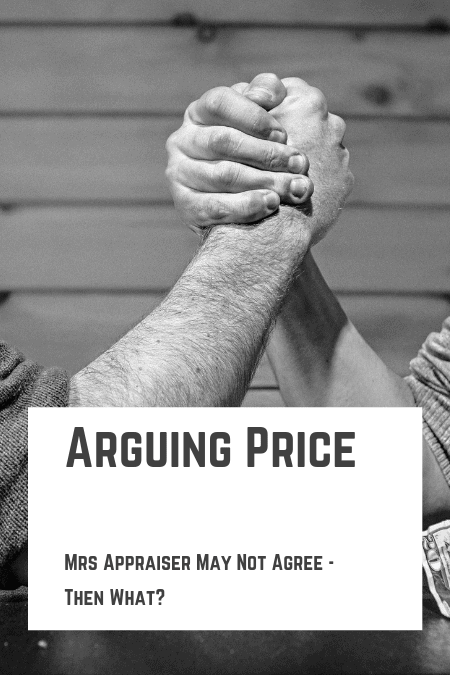 🙅 Mrs Appraiser May Not Agree – Then What? Finally, after 3 months and 3 price reductions, you get that big fat offer of $590k. The buyer is purchasing with an FHA loan and 3.5% down payment. The buyer barely has any money for closing costs, so his agent requested your assistance with closing costs. You reluctantly agreed to the $12,000 contribution. You’ve also made 3 payments of $2,900 (let’s call that $6,000). The appraiser for the FHA loan cannot find comparable sales for your house. He reaches out to your agent. Your agent isn’t much help by providing sales that are too far away. The appraiser ends up valuing the home at $577K. Remember, the buyer has no extra money. Your only choice seems to be to lower the price to the appraised value or to look for a new buyer. Option B could take months. That means more payments. There would be no guarantee that would happen as soon as you’d like either. So, you lower the price to appraised value. Eventually, you close the deal. $6,000 in house payments you have made over the last 3 months. Your neighbor got $575,000 and you know your house is a little nicer. So this little Pricing experiment ran you at least $16,000. It’s one of those things that will remain seared in your memory for longer than you’d like. As you think back on this (even though you’d love to forget it) you realize that your high price helped sell Robin’s house. Most of the time the serious buyer is already uber acquainted with your area. In addition to that, it is possible that they have missed out on a house or two. Why? Because they may have been looking for weeks or months. Robin may not be aware, but you are keenly aware. You have been given an honorary diploma from the School of Hard Knox. As explained earlier, your delayed sale takes money right out of your pocket. Payments, price reductions, and seller contributions are all in the mix. Sure you were able to test the market. In this case, the market answered back. The key is to do your homework up front. If your dwelling is unique you will be well served to pay for an upfront appraisal. At the end of the day, the extra time did erode at your bottom line. As it turns out home pricing is no game. Real estate pricing has to be done with great care. Below are some articles from top agents all across the land. If you are considering the sale of your home we’d be honored to be considered for the job. Getting a head start with price will help. Use our online tool to establish a “ballpark” number. We will guide you towards a more refined number as you get closer to putting your home on the market. You can reach me at 1-480-442-3501 by text or call.